A few weeks ago New York City had a rare treat: a several day visit by several members of Oulipo for a series of readings and a workshop or two. I was able to make a few of the events and had the honor of being invited to a special brunch-followed-by-reading at the Cultural Services of the French Embassy. What follows is a quick summary of what I saw along with a few photos. 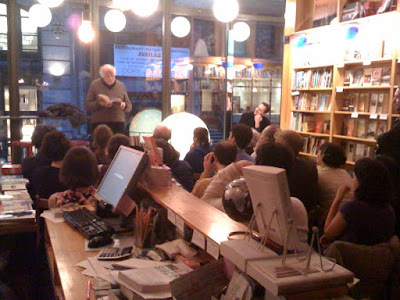 On Thursday April 3 I made my way to Idlewild bookstore near Union Square for a reading by Jacques Roubaud of excerpts in English from Dalkey Archive’s newly-published translation of The Loop, the second novel in the six-book cycle of novels collectively known as “The Great Fire of London”. Roubaud read two excerpts from the book, the first a playful essay on children’s relationships with their “security blankets” (a term he disapproves of, frowning in mock-reproach at Charles Schulz for popularizing it), the second a series of inter-related memories about his childhood in WWII, when his parents were part of the Résistance, provoked by some amateur film footage seen on a hotel TV in London in the 1980s. After the reading he answered questions (often with lengthy digressions) in a slightly British accent. There was a fair amount of discussion of some of the constraints that underlie this work, which I would say are more procedural than formal: Roubaud writes each section of the books between 3 or 4AM and sunrise; once a section is finished he is not allowed to go back and change it (though he does do corrections in a given writing session); he has to aim to tell the truth to the best of his ability whenever he’s writing. I have the first book in the series and it is sturctured with chapters followed by sections called “insertions” (into corresponding chapters) and “bifurcations” and it seems that in these sections he can expand, qualify, or digress on the writing from the (relatively) principle chapters. The next morning I went to NYU’s Maison Française in Washington Mews to see Oulipian Ian Monk (one of the few non-French members) and translator/biographer David Bellos discussing the work of Georges Perec and specifically their work as his translators. (I’m afraid I don’t have any pictures but Tom Motley was sitting behind me sketching the whole time.) It was an interesting talk and shed some light on Perec’s methods and thoughts about writing under constraint. Apparently he came to regret how much he had revealed about the structure of Life A Users Manual, fearing that people would read it not as a novel but merely as a kind of treasure hunt. In a related way, many of his constraints for that novel have built-in flaws assuring that there would still be human blood coursing through the Rube-Goldbergesque contraption that is the novel’s structure. I was struck by how often David Bellos referenced “exercises in style” (never specifically mentioning Queneau but clearly having him in mind) as a principle underlying Life A Users Manual and Perec’s work in general. Specifically, I came away wondering if the 99 chapters of that novel (technically the constraints call for 100) wasn’t an homage of sorts to Queneau. Two revelations about the Perec book Three, which Monk translated: first of all, David S Godine apparently botched Monk’s painstaking index of all the rhetorical devices Perec used in “Which Moped…”; second, I read and enjoyed “A Gallery Portrait” a few years ago without realizing that the paintings described (there are 99 of them as it turns out) can be read as riffs on all the chapters of Life A Users Manual. After the event I introduced myself to Ian Monk and we talked for a minute about Oubapo. He was also particularly intrigued by Jessica’s idea for Oujapo, or the workshop for potential gardening. I owe him an e-mail about it. One enticing tidbit that came out of the Q&A is the fact that Monk (who has done acclaimed translations of Raymond Roussel as well, in fact I’m waiting for a copy of his New Impressions of Africa in the mail) has a complete translation of Perec’s La Disparition which he submitted to the publisher literally weeks after they had signed on Gilbert Adair, who translated the book–with considerable liberties and embellishments, of which Monk showed scant approval (see his lipogrammatic critique in Writings for Oulipo)–as A Void. I suggested he should make his translation available, if only through unofficial/private channels, but I’m not going to hold my breath for it.